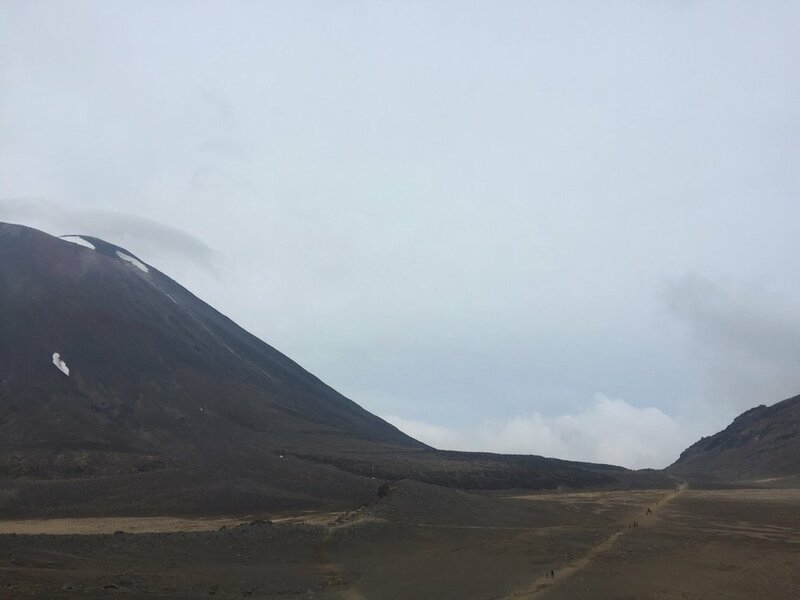 Tongariro holds the title as New Zealand's oldest national park (and the fourth oldest in the world) - gifted to the nation by the Ngāti Tūwharetoa Māori chief, Te Heuheu Tukino, back in the 1880s. Then, just over a hundred years later, the park was awarded dual World Heritage Site status. It’s a special place. Awe-inspiring mountains and rich forests. The status recognises the park's important Māori cultural and spiritual associations, and its outstanding volcanic features. That’s right, three volcanic mountains - Tongariro, Ngauruhoe and Ruapehu. Apparently around a million people visit the park each year. Think of the popular ski fields on Mt Ruapehu. But it turns out there are more visitors in summer than winter, due to the tremendous tramping (that’s hiking) opportunities. 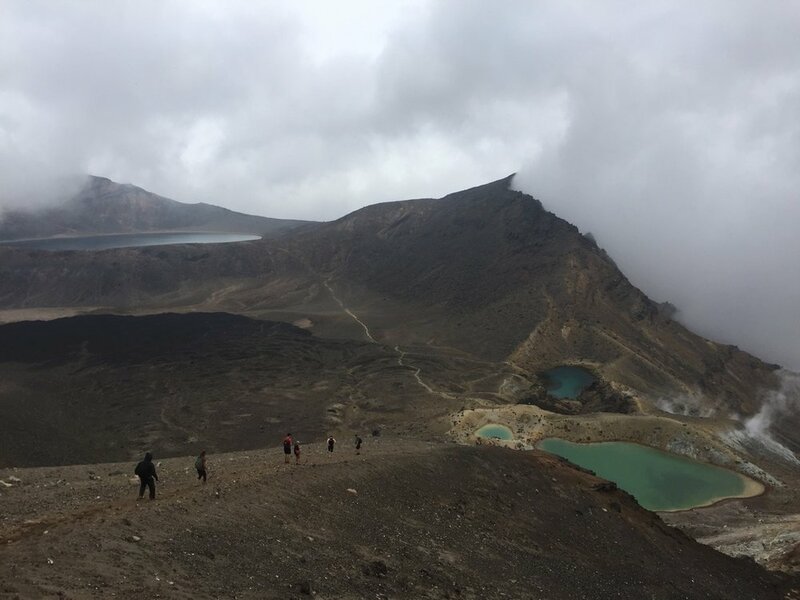 And the Tongariro Alpine Crossing sure is a great walk to seek out - a one day expedition through some other-worldly terrain, along the slopes of all three of the park’s volcanic mountains. Steaming craters (yes, they’re active….Tongariro erupted as recently as 2012), old lava flows and emerald lakes make the walk a really memorable experience. And then, after a big hike like that, there’s an impressive chateau to visit. That’s right, a chateau right here. Welcome to Chateau Tongariro! The hotel was originally built to attract visitors to the newly established national park. It was styled on the Canadian resort in Lake Louise, to offer overseas tourists an international standard of accommodation. It does feel like a step back in time, with the hospitality of times past. There’s not much else like it in this little country. And it’s a tremendous spot to spend an hour or two after a hike. Time for high tea? In the Ruapehu lounge of Chateau Tongariro you can sit in front of the big picture window, framing Mt Ngaruhoe (that’s Mt Doom, to Lord of the Rings experts), and enjoy afternoon tea. The Chateau high tea marks a decades-old tradition of meeting for finger sandwiches, delicate sweets, pots of tea, and (go on, it adds to the occasion) champagne. And recall the origin of the afternoon tea tradition, in fact a relatively new tradition. Of course the practice of drinking tea dates back to ancient China, and was popularised in England during King Charles II’s reign in the 1660s. But it was not until the mid 19th century that “afternoon tea” first appeared. The story goes that one of Queen Victoria’s ladies in waiting (Anna, the seventh Duchess of Bedford) would become hungry in the afternoon, as the noon lunch became distant and the evening meal still far off. She asked that a tray of tea, bread and butter and cake be brought to her room during the late afternoon. This became a habit, and she began sending cards inviting friends to join her. And so the practice began, becoming a fashionable social event. Women would change into long gowns, gloves and hats for afternoon tea, usually served in the drawing room. There’s no need for long gowns at the Chateau high tea. But make sure you enjoy the dainty sandwiches, scones with cream and preserves, cakes and tea in china cups. Most restorative and satisfying, after national park activities. For more on what to find and enjoy on North Island travels, including a Chateau visit, explore food treasures on our North Island Food Travel Guide app - click here. You’ll find all delightful coffee stops and eateries, artisan producers, and a whole lot more.